The 10th annual Easter Duck Race got off to a damp start this year after a glorious Easter. However the weather did not put off the huge crowd cheering on the yellow and white ducks! 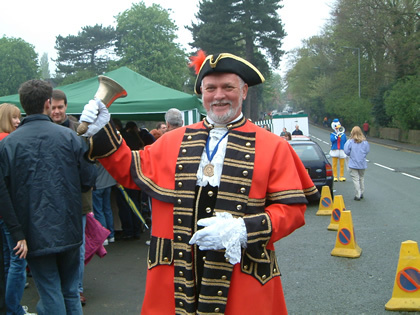 Town Crier Peter Powell opened the event. The Cheshire Fire Brigade based at Stockton Heath, launched the ducks to a rousing send-off. The ducks floated down the Dingle in a regal way, some crashing in to the reed and into each other causing foul play! Mike Baker in his canoe had to give several ducks a yellow card for their misbehaviour after a battle round the Dingle it was neck and neck. People waited in great suspense. Some of the ducks towards the end had to be disqualified for bad behaviour! The crowd cheered as the ducks approached the Lower Dam, the sun just started to shine down on the winners. The winning corporate duck was no. 13 (lucky for some). Just Be U sponsored this duck. This firm is a consultancy for disability awareness. Their prize was a meal at La Boheme restaurant. The private duck winner was no. 267 winning £100 for Jamie Lee Marshall. A close second was no. 13 winning £50 for Sue & Les Ralphs. The blue Duck was never seen in the water and was disguised as Garry Mogey, the chairman of Lymm Round Table! The pink duck was the main organiser of the event disguised as Steve Robinson! Of course these big ducks needed a lot of help from all the other ducks and the Round Table's hard working members. All proceeds are going to local charities. Thanks to every one for their generous support and financial corporate backing. The Lymm.net Duck was nowhere to be found at the end of the race, we suspect he went to the Spread Eagle after being disqualified for duck fouling! Well done everyone for supporting this fun event!